Rolled out today on the Fixation sporting a slightly used Bonty 29x2.2 front tire and it barely fits within the 1x1 fork. By barely, I mean there are a few knobby edges that are hitting the bottom of the fork and making an intermittent rubbing sound. At the bottom of my driveway, I decided that I would take care of it when I got home. As you can see, it's a tight fit. I think there is half a millimeter clearance, if that. Once on the trail, rubbing noise aside, this bike rides so nicely that I keep asking myself, why do we need suspension bikes? The answer came to me about three hours later with a little soreness in the back and shoulders. Rode the Upper Gussy from south to north, mainly because I really wanted to finish the re-route. 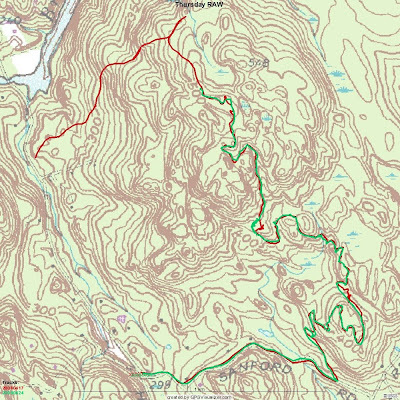 After studying the track from the ride a week ago, which is the red track on the map below, I decided that the new section wasn't flowy enough and had too many sharp turns and by looking at the contours I figured if I swung the trail out a little more there wouldn't be much additional climbing. Now, instead of making the sharp right turn as you can see in the blow up below where the red track goes off on it's own and then hooks back up, the new route continues the upward climb and then makes a more sweeping turn and hooks up to where I left the old bucket. 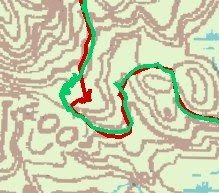 The cool thing about this change is that there are many more features the trail passes by including more rollers and a few baby heads, one right even in the middle of the trail. This section of the trail is marked but it's not cleared. Speaking of clearing, the trail is almost 100% cleared of leaves! Tom and his back pack blower did a tremendous job and it seemed that he might have done some this work this week even! Found another pair of gloves, this time work gloves, that probably belong to Paula. They were on the side of Sanford Road where the Jeep Trail intersects. Below is the up and over and where Tom stopped blowing the leaves. Not sure of that water bottle is his or someone else's but I bought it out with me. I did one stupid thing here. I paused the Edge and then forgot to turn it back on till I was just about out of the forest so I probably lost a half mile on my miles tally. That is the one thing I don't like about the Garmin Edge, is that it only records where you have been if the stop watch is running, otherwise it does nothing. I have done this before and usually I just turn it back on back track to where I started and re-ride the part I have missed. Only this time I wasn't going to climb all the way back to the up and over just to turn around and come back down again. If I had more time, maybe I would have. I wanted to take a trail shot of the Fixation and I think I got a really good picture of it above. With the glow of the setting sun in the background it almost looks surreal. A few seconds later, I took another of me and the Fixation below and that mystical lighting had all but faded. And what better way to end a ride than to have a nice, fresh BBC. 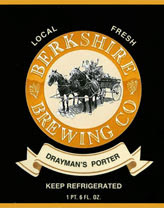 I figured I might as well kill that last bottle of Drayman's Porter and maybe the last one that had was from a bad batch or something because this was one was awesome! Granted, the Imperial Stout is still better, but the Drayman's was perfect for a post ride libation! if you rode 3 hours of fixed in the woods then you are no question DA MAN !! !